Think the mulberry plant is just meant as a food for silk worms? Think again. This plant is Mother Nature’s blessing to mankind – a remedy and a solution for a myriad of health problems that are seemingly unsolvable by modern medicine. Mulberry leaves have been used by Ayurveda as a healing agent for centuries and you too can make the most of this amazing natural remedy through Organic Veda’s mulberry leaf Powder. Delicious, fleshy, succulent mulberries are less in calories. 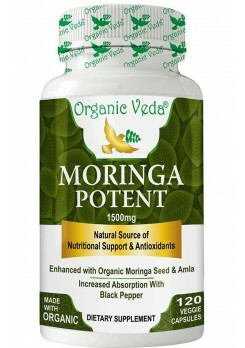 They compose of health-promoting phytonutrient compounds like polyphenol pigment antioxidants, minerals, and vitamins that are essential for optimum health. Mulberries have significantly high amounts of phenolic flavonoid phytochemicals called anthocyanins. One of the most amazing characteristic that can only be found in the Mulberry Leaf is an ingredient known as moranoline (1-Deoxynojirimycin / 1-DNJ) which inhibits an enzyme in the intestinal tract (alpha-glycosidase) involved in the digestion of carbohydrates. Moranoline or 1-DNJ holds back complex carbohydrates, starches, maltose and sucrose from breaking down into glucose. How to Consume Mulberry Leaf Powder? So! 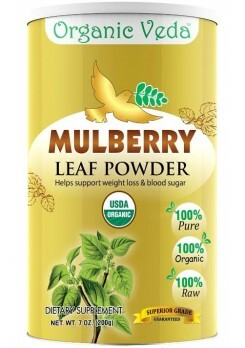 lets buy online today & enjoy the benefits of Mulberry Leaves & Stay healthy! Additionally, Organic Veda brings to you the goodness of Mulberry Leaves packed in easy-to-use containers in the form of Mulberry Leaf Capsules.